"In my opinion, the Bull Terrier family tree should be classified as follows: 1. The Staffordshire Bull Terrier (The English Pit Bull Terrier) 2. 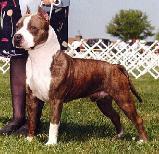 The Staffordshire Terrier (American PIt Bull Terrier) 3. The all white English Bull Terrier and colored Bull Terrier. There is no getting away from the fact that these dogs all belong to the same family.